Below are answers to our most frequently asked questions. Have a question not tackled below? See if you can stump the experts and send your question here. DO I NEED ANY SPECIAL SOFTWARE OR COMPUTER REQUIREMENTS? You do not. Everything is web based so you can work from all of the most popular browsers. CAN I USE THE THEME WITH MY OWN URL? DOES IT WORK WITH IDX AND HOW DO I GET IT? It does. In fact the all Winning Agent Themes were designed knowing that many agents will want this option. Our preferred IDX provider is IDX Broker. DO I HAVE TO USE IDX BROKER? Nope! We recommend IDX Broker as a result of our own research of available WordPress IDX plugins and services. If you have another IDX provider you prefer, go for it! They key to successfully integrating your IDX of choice is to customize (read: eliminate) a lot of the CSS that comes with the IDX feed so that you can take advantage of the native theme styles provided with Winning Agent Pro. ARE YOUR THEMES COMPATIBLE WITH PLUGINS AND WIDGETS? 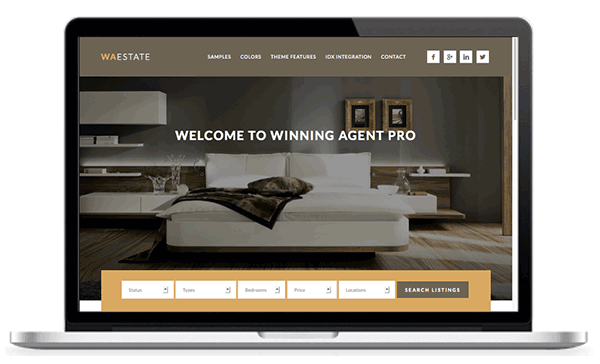 Yes, all Winning Agent themes come with a widgetized home page and standard header, footer, and sidebar widget areas. Winning Agent themes are styled to specifically work with these plugins: AgentPress Listings, Simple Social Icons, Gravity Forms, Jetpack, and more. WHAT DOES IT MEAN THAT THE THEME IS “PRINT FRIENDLY?” I DON’T SEE ANY PRINT BUTTONS. To add a print button to a page, post, or property, you’ll want to use a social sharing plugin, like Jetpack. Then, whether you use a plugin’s print button or the browser’s print button, the theme is styled so that anything printed is automatically stripped of the header/sidebar/footer and only the primary content area prints. WHAT IS GENESIS AND DO I HAVE TO BUY A COPY, TOO? The Genesis Framework is the foundation of all Winning Agent themes and is required. The Genesis Framework provides out of the box SEO options, blazing fast performance, and rock-solid security. For more information or to purchase the Genesis Framework, click here. 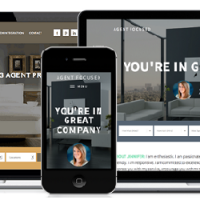 CAN I USE THE WINNING AGENT PRO THEME ON WORDPRESS.COM? No. 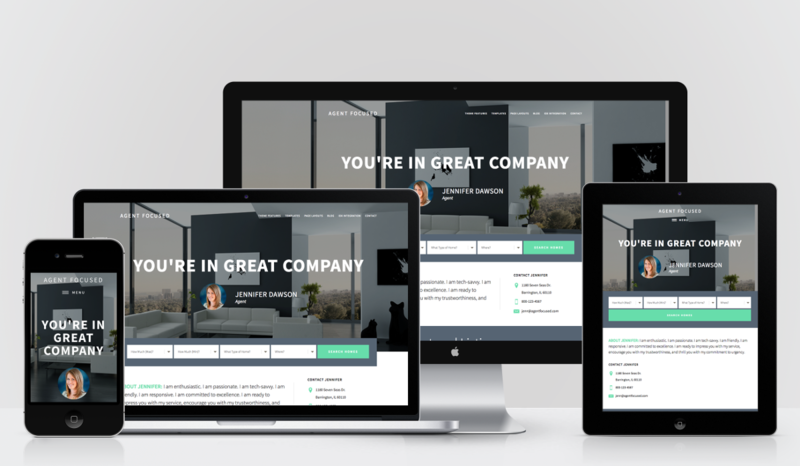 The Winning Agent Pro theme is only available for self-hosted WordPress sites running the Genesis Framework. DO YOU RECOMMEND ANY PARTICULAR TYPE OF HOSTING AND WHY? ARE THEME UPDATES INCLUDED IN THE PRICE I PAID AND FOR HOW LONG? Theme updates are rare, but any updates we roll out are available to you for life. Or until Jesus comes, whichever happens first. 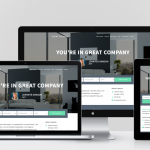 CAN I USE THE WINNING AGENT THEMES ON MORE THAN ONE SITE? All Winning Agent themes are licensed under GPLv2+, which means you are free to use the theme over and over again on your site or on sites you build for clients. CAN YOU HELP ME PROVIDE CONTENT FOR MY WEBSITE? 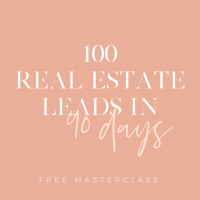 CAN YOU HELP ME SET UP MY WINNING AGENT PRO SITE? Sure thing! We have options available to set up your theme to look like the demo, with or without IDX integration. For pricing and available services, please contact us. ARE THE PHOTOS I SEE IN THE DEMO INCLUDED WITH THE THEME? No they are not. You wouldn’t want them to be — you’ll want to make your own site unique to who you are by including your own photos. We get many of our photos from this provider – Bigstock. DO YOU OFFER INDIVIDUAL THEME CUSTOMIZATIONS? You bet! We offer custom color and font options to help you make Winning Agent themes your own. Contact us and let us know what you need and we’ll provide a custom quote. If we can’t resolve your issue to your satisfaction via support, we will happily refund your purchase. DO YOUR THEMES WORK WITH ALL INTERNET BROWSERS? Winning Agent themes work with the latest versions of all major browsers. Note that the design may vary slightly between browsers, but we’ve tested to make sure it still looks cool everywhere.